CAPE CANAVERAL, Florida -- Don't worry if you didn't stay up late or wake up early to watch last night's meteor shower. That's because the meteor shower that was predicted to be a "meteor storm" never happened. So news stations across the U.S. will not have any photos or videos of last night's meteor shower. 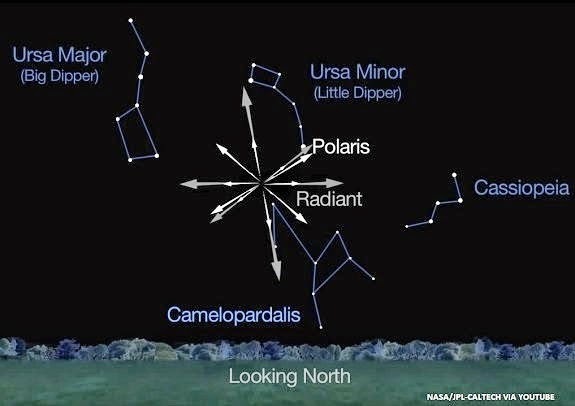 NASA astronomers had predicted that the Camelopardalid meteor shower, which had never been seen by humans, could appear overnight on May 23-24, 2014. NASA had a live stream and chat dedicated to watching last night's meteor shower. "From reading the comments, it sounds like some people saw some good meteors, but many people didn't see a lot of meteors," said a NASA chat moderator. "As astronomer Bill Cooke had said from the beginning, "The parent comet doesn’t appear to be very active now, so there could be a great show, or there could be little activity.” While there's always the hope that we'll end up with "a great show," Nature gives us what we get. :)"
The meteor shower was suppose to be caused by debris particles from the Comet 209P/LINEAR. The forecast was uncertain because no one was sure how much debris the Earth would encounter because it depends on how much debris was left by the comet back in the 1800's.